Leonardo da Vinci’s Mona Lisa is one of the most famous paintings of all time. And there has always been a discussion around her enigmatic smile. He used a trademark Renaissance technique called sfumato, which involves many thin layers of glaze mixed with subtle pigments. 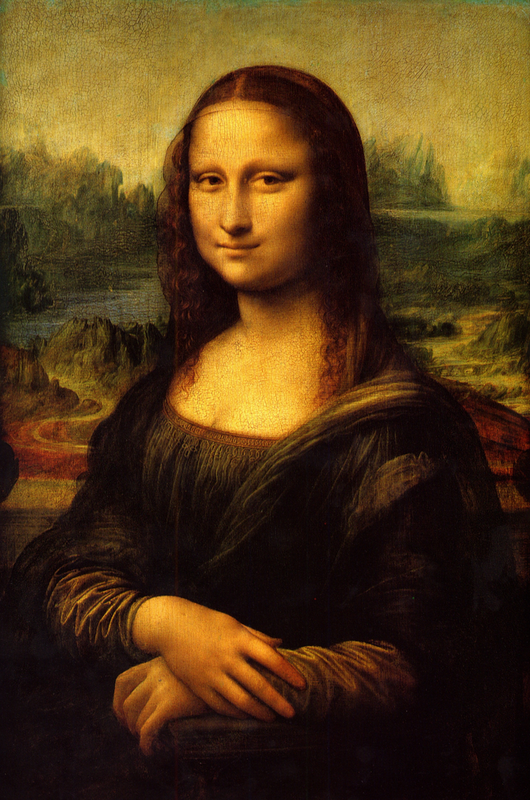 The striking result is that when you look directly at Mona Lisa’s smile, it seems to disappear. But when you look at the background your peripherals see a smiling face. Here you see a woman in the foreground, but step back quite far from the picture and there is a (more or less) clear image of Abraham Lincoln. Here the question of gaze is the blaring focus of the work. 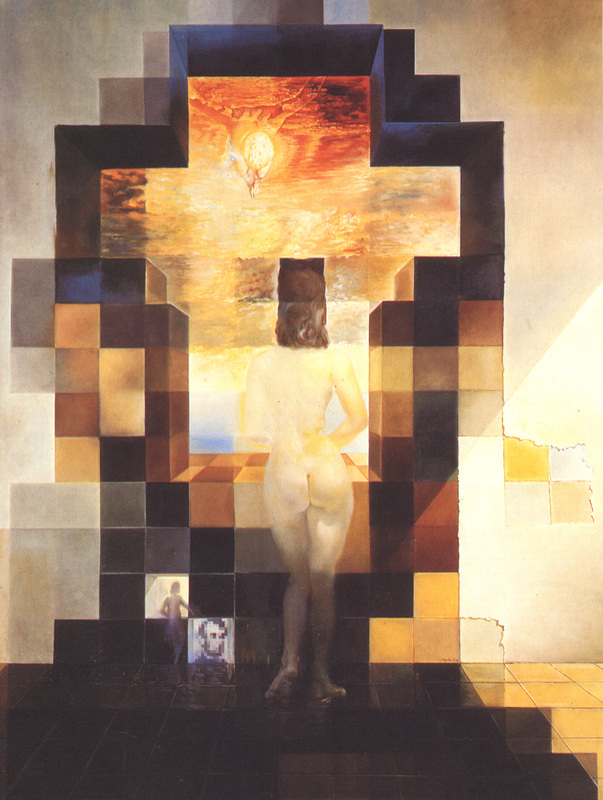 Now of course Dali and da Vinci weren’t scribbling down equations and computing integrals; their artistic expression was much less well-defined. But we the artistically challenged have tools of our own: mathematics, science, and programming. In 2006 Aude Oliva, Antonio Torralba, and Philippe. G. Schyns used those tools to merge the distance of Dali and the faded smiles of da Vinci into one cohesive idea. In their 2006 paper they presented the notion of a “hybrid image,” presented below. If you look closely, you’ll see three women, each of which looks the teensiest bit strange, like they might be trying to suppress a smile, but none of them are smiling. Blur your eyes or step back a few meters, and they clearly look happy. The effect is quite dramatic. At the risk of being overly dramatic, these three women are literally modern day versions of Mona Lisa, the “Mona Lisas of Science,” if you will. 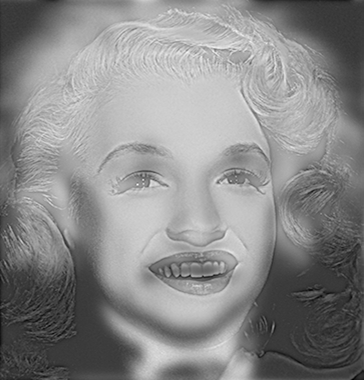 Another, perhaps more famous version of their technique, since it was more widely publicized, is their “Marilyn Einstein,” which up close is Albert Einstein and from far away is Marilyn Monroe. This one gets to the heart of the question of what the eye sees at close range versus long range. And it turns out that you can address this question (and create brilliant works of art like the ones above) with some basic Fourier analysis. The basic idea of Fourier analysis is the idea that smooth functions are hard to understand, and realization of how great it would be if we could decompose them into simpler pieces. Decomposing complex things into simpler parts is one of the main tools in all of mathematics, and Fourier analysis is one of the clearest examples of its application. where can be any integer. If you have done some linear algebra (and ignore this if you haven’t), then I can summarize the idea succinctly by saying the complex exponentials form an orthonormal basis for the vector space of square-integrable functions. Back in colloquial language, what the Fourier theorem says is that any function of the kind we care about can be broken down into (perhaps infinitely many) pieces of this form called Fourier coefficients (I’m abusing the word “coefficient” here). The way it’s breaking down is also pleasingly simple: it’s a linear combination. Informally that means you’re just adding up all the complex exponentials with specific weights for each one. Mathematically, the conversion from the function to its Fourier coefficients is called the Fourier transform, and the set of all Fourier coefficients together is called the Fourier spectrum. So if you want to learn about your function , or more importantly modify it in some way, you can inspect and modify its spectrum instead. The reason this is useful is that Fourier coefficients have very natural interpretations in sound and images, as we’ll see for the latter. We wrote and the complex exponential as a function of one real variable, but you can do the same thing for two variables (or a hundred!). 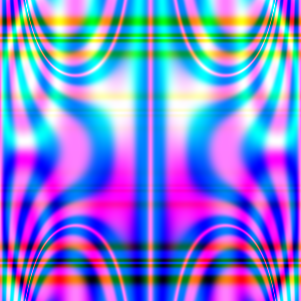 And, if you’re willing to do some abusing and ignore the complexness of complex numbers, then you can visualize “complex exponentials in two variables” as images of stripes whose orientation and thickness correspond to two parameters (i.e., the in the offset equation becomes two coefficients). The video below shows how such complex exponentials can be used to build up an image of striking detail. 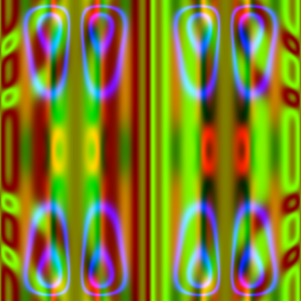 The left frame shows which complex exponential is currently being added, and the right frame shows the layers all put together. I think the result is quite beautiful. This just goes to show how powerful da Vinci’s idea of fine layering is: it’s as powerful as possible because it can create any image! If you give me an image (or any function!) I can compute the decomposition very efficiently. And the same theorem lets you go the other way: if you give me the decomposition, I can compute the original function’s samples quite easily. The algorithm to do this is called the Fast Fourier transform, and if any piece of mathematics or computer science has a legitimate claim to changing the world, it’s the Fast Fourier transform. It’s hard to pinpoint specific applications, because the transform is so ubiquitous across science and engineering, but we definitely would not have cell phones, satellites, internet, or electronics anywhere near as small as we do without the Fourier transform and the ability to compute it quickly. 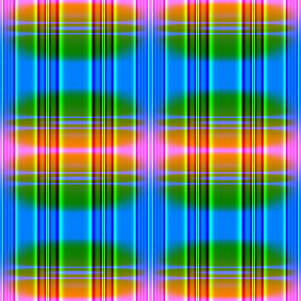 Constructing hybrid images is one particularly nice example of manipulating the Fourier spectrum of two images, and then combining them back into a single image. That’s what we’ll do now. As a side note, by the nature of brevity, the discussion above is a big disservice to the mathematics involved. I summarized and abused in ways that mathematicians would object to. 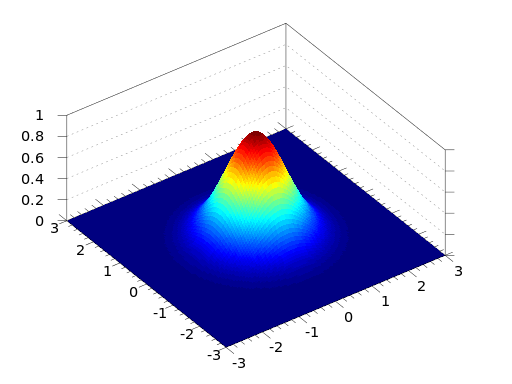 If you want to see a much better treatment of the material, this blog has a long series of posts developing Fourier transforms and their discrete analogues from scratch. See our four primers, which lead into the main content posts where we implement the Fast Fourier transform in Python and use it to apply digital watermarks to an image. Note that in those posts, as in this one, all of the materials and code used are posted on this blog’s Github page. Each dot in this grid corresponds to how “intense” the Fourier coefficient is. That is, it’s the magnitude of the (complex) coefficient of the corresponding complex exponential. 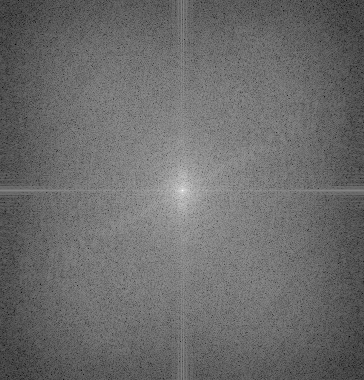 Now the points that are closer to the origin correspond informally to the broad, smooth changes in the image. These are called “low frequency” coefficients. And points that are further away correspond to sharp changes and edges, and are likewise called “high frequency” components. So the if you wanted to “hybridize” two images, you’d pick ones with complementary intensities in these regions. 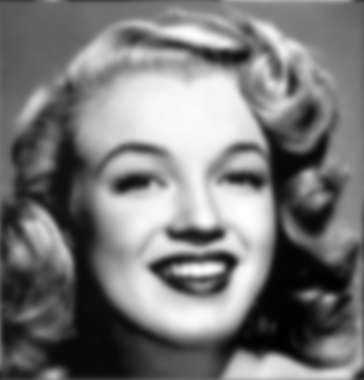 That’s why Einstein (with all his wiry hair and wrinkles) and Monroe (with smooth features) are such good candidates. 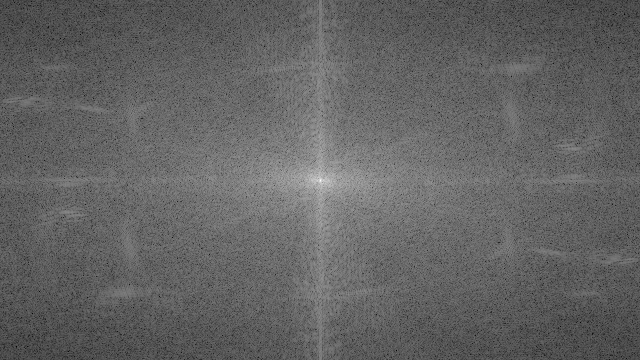 That’s also why, when we layered the Fourier components one by one in the video from earlier, we see the fuzzy shapes emerge before the fine details. Moreover, we can “extract” the high frequency Fourier components by simply removing the low frequency ones. It’s a bit more complicated than that, since you want the transition from “something” to “nothing” to be smooth in sone sense. A proper discussion of this would go into sampling and the Nyquist frequency, but that’s beyond the scope of this post. Rather, we’ll just define a family of “filtering functions” without motivation and observe that they work well. In particular, at zero the function is 1 and it gradually drops to zero as you get farther away. 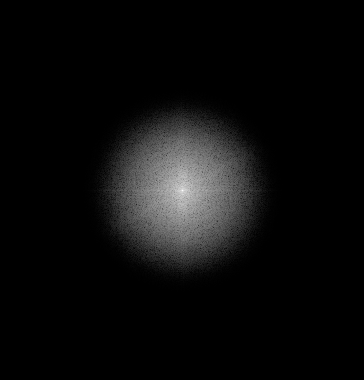 The parameter controls the rate at which it vanishes, and in the picture above the center is set to . 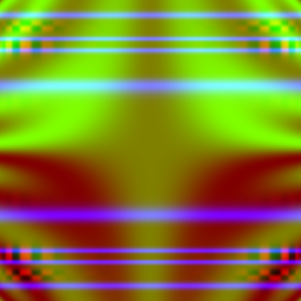 Now what we’ll do is take our image, compute its spectrum, and multiply coordinatewise with a certain Gaussian function. If we’re trying to get rid of high-frequency components (called a “low-pass filter” because it lets the low frequencies through), we can just multiply the Fourier coefficients directly by the filter values , and if we’re doing a “high-pass filter” we multiply by . 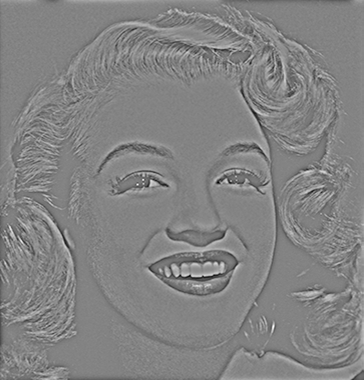 In fact, this is a common operation in programs like photoshop for blurring an image (it’s called a Gaussian blur for obvious reasons). Here’s the python code to do this. You can download it along with all of the other resources used in making this post on this blog’s Github page. And if we compute the average of these two images, we basically get back to the original. So the only difference between this and a hybrid image is that you take the low-passed part of one image and the high-passed part of another. 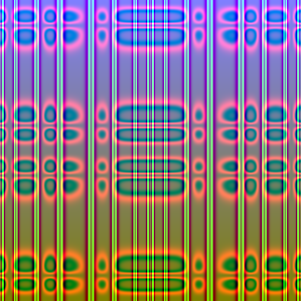 Then the art is in balancing the parameters so as to make the averaged image look right. 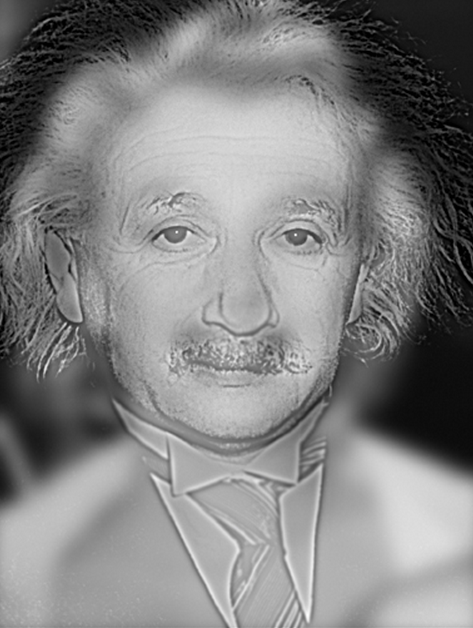 Indeed, with the following picture of Einstein and the above shot of Monroe, we can get a pretty good recreation of the Oliva-Torralba-Schyns piece. I think with more tinkering it could be even better (I did barely any centering/aligning/resizing to the original images). Albert Einstein, Marilyn Monroe, and their hybridization. Interestingly enough, doing it in reverse doesn’t give quite as pleasing results, but it still technically works. So there’s something particularly important that the high-passed image does have a lot of high-frequency components, and vice versa for the low pass. You can see some of the other hybrid images Oliva et al constructed over at their web gallery. How can we take this idea further? There are a few avenues I can think of. The most obvious one would be to see how this extends to video. Could one come up with generic parameters so that when two videos are hybridized (frame by frame, using this technique) it is only easy to see one at close distance? Or else, could we apply a three-dimensional transform to a video and modify that in some principled way? I think one would not likely find anything astounding, but who knows? Second would be to look at the many other transforms we have at our disposal. 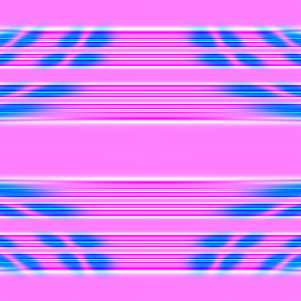 How does manipulating the spectra of these transforms affect the original image, and can you make images that are hybridized in senses other than this one? My girlfriend and I decided we want a print of my recent artistic creation from the post Bezier Curves and Picasso. I set up an account at Society6, which does professional art printing (framed or unframed). I can’t imagine anyone beside me would be interested in including this in their art collection, but just in case it’s available for sale here. I plan to put it below my print of Picasso’s “Dog.” Donning my pretentious art-snob hat, the juxtaposition of two abstract representations of the same idea adds a profound depth to the work as a whole. Warning: I have not yet ordered this print, so I cannot attest to the quality (perhaps it’s pixelated and I need to produce a higher quality version). I will be travelling to conferences and doing last-minute preparations for a preliminary exam over the next three weeks, so I won’t be ordering the print until June. If people are interested, leave a comment and I will send a notification via Twitter/Google+/Facebook with my thoughts once I get it. Disclosure: I receive a $5.00 commission on any purchase. If you want a more direct way to support this blog, consider donating via Paypal. Pablo Picasso in front of The Kitchen, photo by Herbert List. These paintings are extremely simple but somehow strike the viewer as deeply profound. They give the impression of being quite simple to design and draw. A single stroke of the hand and a scribbled signature, but what a masterpiece! It simultaneously feels like a hasty afterthought and a carefully tuned overture to a symphony of elegance. 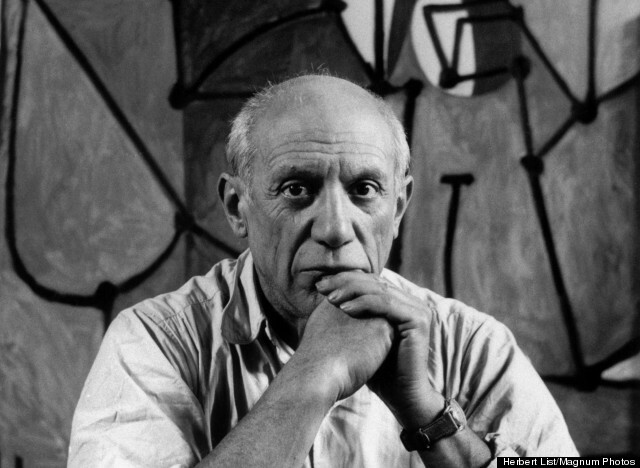 In fact, we know that Picasso’s process was deep. 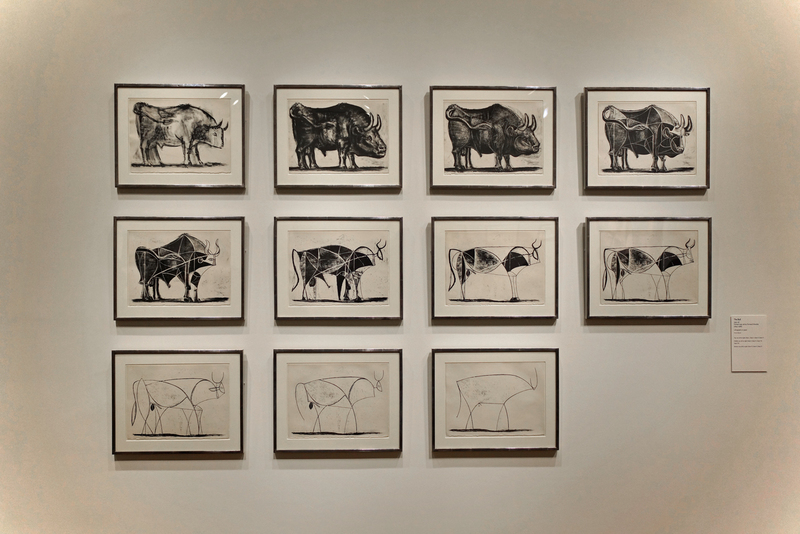 For example, in 1945-1946, Picasso made a series of eleven drawings (lithographs, actually) showing the progression of his rendition of a bull. The first few are more or less lifelike, but as the series progresses we see the bull boiled down to its essence, the final painting requiring a mere ten lines. Along the way we see drawings of a bull that resemble some of Picasso’s other works (number 9 reminding me of the sculpture at Daley Center Plaza in Chicago). Read more about the series of lithographs here. 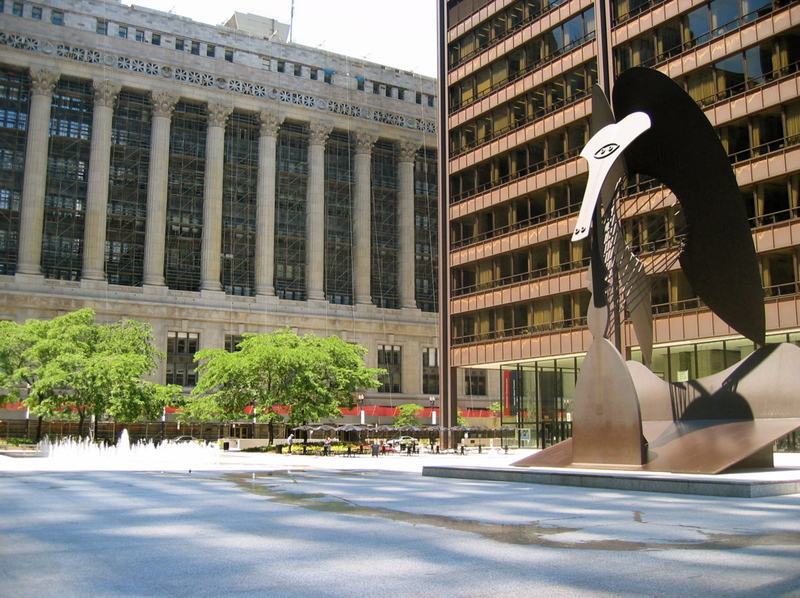 Picasso’s, “The Bull.” Photo taken by Jeremy Kun at the Art Institute of Chicago in 2013. Click to enlarge. When asked to conjure a “curve” most people (perhaps plagued by their elementary mathematics education) will either convulse in fear or draw part of the graph of a polynomial. While these are fine and dandy curves, they only represent a small fraction of the world of curves. 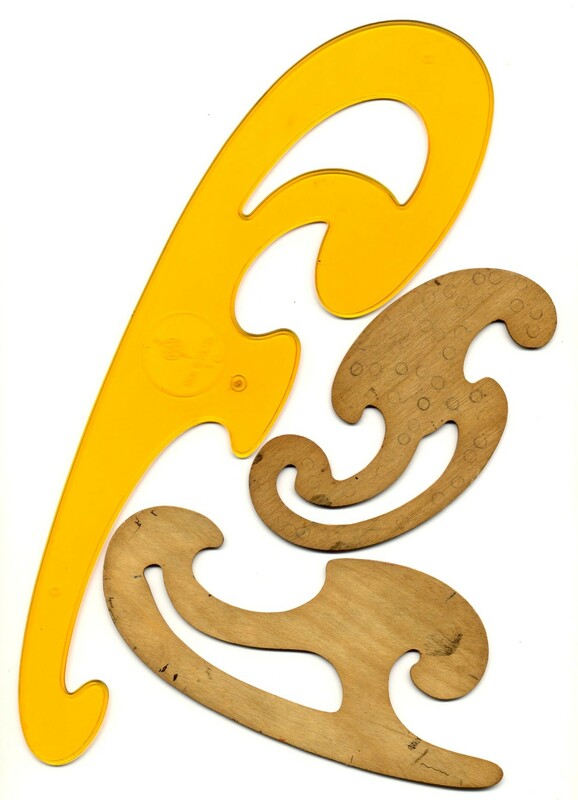 We are particularly interested in curves which are not part of the graphs of any functions. For instance, a French curve is a physical template used in (manual) sketching to aid the hand in drawing smooth curves. Tracing the edges of any part of these curves will usually give you something that is not the graph of a function. It’s obvious that we need to generalize our idea of what a curve is a bit. The problem is that many fields of mathematics define a curve to mean different things. The curves we’ll be looking at, called Bezier curves, are a special case of single-parameter polynomial plane curves. This sounds like a mouthful, but what it means is that the entire curve can be evaluated with two polynomials: one for the values and one for the values. 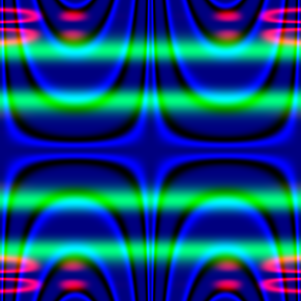 Both polynomials share the same variable, which we’ll call , and is evaluated at real numbers. But it’s clear that we can write any single-variable function in this parametric form: just choose and . So these are really more general objects than regular old functions (although we’ll only be working with polynomials in this post). Here the coefficients are points (which are the same as vectors) in the plane, and we represent the function in boldface to emphasize that the output is a point. The linear-algebraist might recognize that pairs of polynomials form a vector space, and further combine them as . But for us, thinking of points as coefficients of a single polynomial is actually better. This screenshot was taken from a wonderful demo by data visualization consultant Jason Davies. It expresses the mathematical idea quite superbly, and one can drag the three points around to see how it changes the resulting curve. One should play with it for at least five minutes. We call the control points of . Higher dimensional Bezier curves can be quite complicated to picture geometrically. 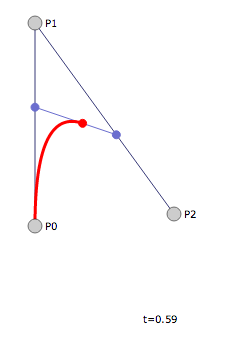 For instance, the following is a fifth-degree Bezier curve (with six control points). A degree five Bezier curve, credit Wikipedia. The additional line segments drawn show the recursive nature of the curve. The simplest are the green points, which travel from control point to control point. 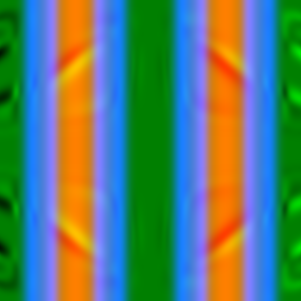 Then the blue points travel on the line segments between green points, the pink travel along the line segments between blue, the orange between pink, and finally the red point travels along the line segment between the orange points. Without the recursive structure of the problem (just seeing the curve) it would be a wonder how one could actually compute with these things. But as we’ll see, the algorithm for drawing a Bezier curve is very natural. Most graphics libraries (including the HTML5 canvas standard) provide a drawing primitive that can output Bezier curves given a list of four points. But suppose we aren’t given such a function. Suppose that we only have the ability to draw straight lines. 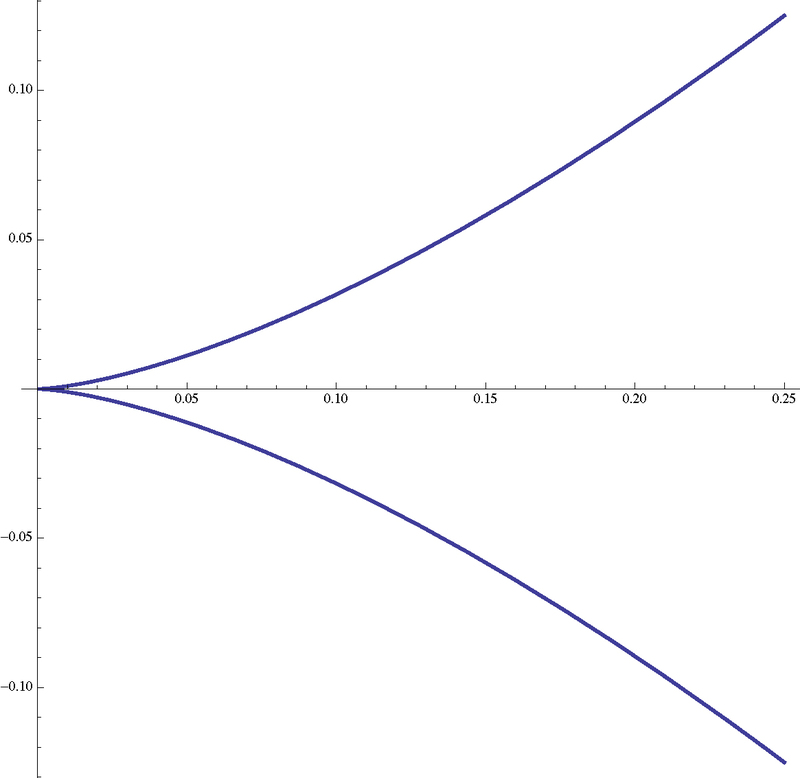 How would one go about drawing an approximation to a Bezier curve? If such an algorithm exists (it does, and we’re about to see it) then we could make the approximation so fine that it is visually indistinguishable from a true Bezier curve. which together trace out the same curve as . The green points are the degree one curves, the pink points are the degree two curves, and the blue point is the cubic curve. We notice that, since each of the curves are evaluated at , each of these points can be described as the midpoints of points we already know. So , etc. In fact, the splitting of the two curves we want is precisely given by these points. That is, the “left” half of the curve is given by the curve with control points , while the “right” half has control points . How can we be completely sure these are the same Bezier curves? Well, they’re just polynomials. We can compare them for equality by doing a bunch of messy algebra. But note, since only travels halfway along , to check they are the same is to equate with , since as ranges from zero to one, ranges from zero to one half. Likewise, we can compare with . The algebra is very messy, but doable. As a test of this blog’s newest tools, here’s a screen cast of me doing the algebra involved in proving the two curves are identical. It just accepts as input a list of points and computes their sequential midpoints. So a list of points is turned into a list of points. As we saw, we need to call this function times to compute the segmentation of a degree Bezier curve. In words, as long as the curve isn’t “flat,” we want to subdivide and draw each piece recursively. If it is flat, then we can simply draw the three line segments of the curve and be reasonably sure that it will be a good approximation. The context variable sitting there represents the canvas to be painted to; it must be passed through to the “drawSegments” function, which simply paints a straight line to the canvas. Of course this raises the obvious question: how can we tell if a Bezier curve is flat? There are many ways to do so. One could compute the angles of deviation (from a straight line) at each interior control point and add them up. Or one could compute the volume of the enclosed quadrilateral. However, computing angles and volumes is usually not very nice: angles take a long time to compute and volumes have stability issues, and the algorithms which are stable are not very simple. We want a measurement which requires only basic arithmetic and perhaps a few logical conditions to check. It turns out there is such a measurement. It’s originally attributed to Roger Willcocks, but it’s quite simple to derive by hand. Essentially, we want to measure the “flatness” of a cubic Bezier curve by computing the distance of the actual curve at time from where the curve would be at time if the curve were a straight line. There’s nothing magical going on here. We’re simply giving the Bezier curve with control points . One should think about this as points which are a 0, 1/3, 2/3, and 1 fraction of the way from to on a straight line. Then we define the function to be the distance between the two curves at the same time . The flatness value of is the maximum of over all values of . If this flatness value is below a certain tolerance level, then we call the curve flat. With a bit of algebra we can simplify this expression. First, the value of for which the distance is maximized is the same as when its square is maximized, so we can omit the square root computation at the end and take that into account when choosing a flatness tolerance. Since the maximum of a product is at most the product of the maxima, we can bound the above quantity by the product of the two maxes. The reason we want to do this is because we can easily compute the two maxes separately. 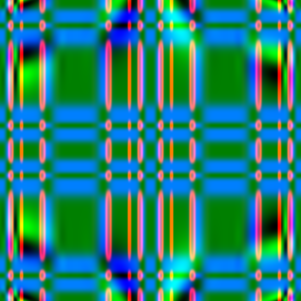 It wouldn’t be hard to compute the maximum without splitting things up, but this way ends up with fewer computational steps for our final algorithm, and the visual result is equally good. And so our condition for being flat is that this bound is smaller than some allowable tolerance. We may safely factor the 1/16 into this tolerance bound, and so this is enough to write a function. And there we have it. We write a simple HTML page to access a canvas element and a few extra helper functions to draw the line segments when the curve is flat enough, and present the final result in this interactive demonstration (you can perturb the control points). 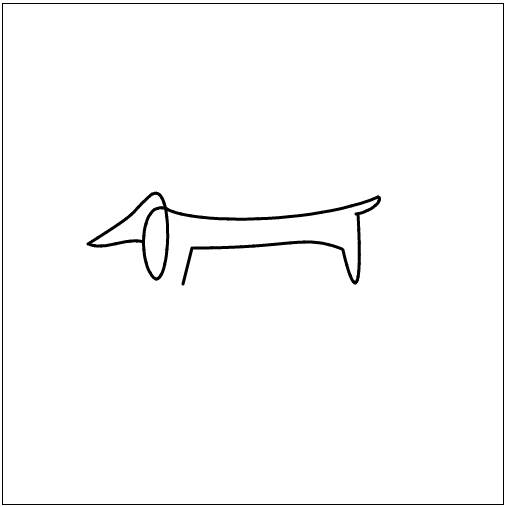 Picasso’s “Dog,” redesigned as a sequence of nine bezier curves. While we didn’t invent the drawing itself (and hence shouldn’t attach our signature to it), we did come up with the representation as a sequence of Bezier curves. It only seems fitting to present that as the work of art. Here we’ve distilled the representation down to a single file: the first line is the dimension of the canvas, and each subsequent line represents a cubic Bezier curve. Comments are included for readability. “Dog” Jeremy Kun, 2013. Click to enlarge. 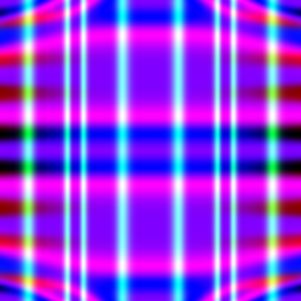 If an int is omitted at the beginning of a line, this specifies a width of three pixels. In a general .bezier file we allow a curve to have arbitrarily many control points, though the code we gave above does not draw them that generally. As an exercise, write a program which accepts as input a .bezier file and produces as output an image of the drawing. This will require an extension of the algorithm above for drawing arbitrary Bezier curves, which loops its computation of the midpoints and keeps track of which end up in the resulting subdivision. Alternatively, one could write a program which accepts as input a .bezier file with only cubic Bezier curves, and produces as output an SVG file of the drawing (SVG only supports cubic Bezier curves). So a .bezier file is a simplification (fewer features) and an extension (Bezier curves of arbitrary degree) of an SVG file. We didn’t go as deep into the theory of Bezier curves as we could have. If the reader is itching for more (and a more calculus-based approach), see this lengthy primer. It contains practically everything one could want to know about Bezier curves, with nice interactive demos written in Processing. 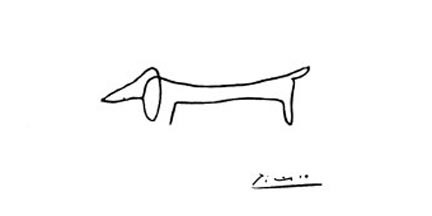 There are some philosophical implications of what we’ve done today with Picasso’s “Dog.” Previously on this blog we’ve investigated the idea of low-complexity art, and it’s quite relevant here. The thesis is that “beautiful” art has a small description length, and more formally the “complexity” of some object (represented by text) is the length of the shortest program that outputs that object given no inputs. More on that in our primer on Kolmogorov complexity. The fact that we can describe Picasso’s line drawings with a small number of Bezier curves (and a relatively short program to output the bezier curves) is supposed to be a deep statement about the beauty of the art itself. Obviously this is very subjective, but not without its proponents. There has been a bit of recent interest in computers generating art. For instance, this recent programming competition (in Dutch) gave the task of generating art similar to the work of Piet Mondrian. The idea is that the more elegant the algorithm, the higher it would be scored. The winner used MD5 hashes to generate Mondrian pieces, and there were many many other impressive examples (the link above has a gallery of submissions). In our earlier post on low-complexity art, we explored the possibility of representing all images within a coordinate system involving circles with shaded interiors. But it’s obvious that such a coordinate system wouldn’t be able to represent “Dog” with very low complexity. It seems that Bezier curves are a much more natural system of coordinates. Some of the advantages include that length of lines and slight perturbations don’t affect the resulting complexity. 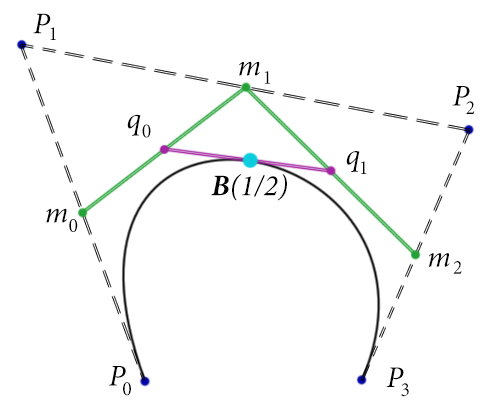 A cubic Bezier curve can be described by any set of four points, and more “intricate” (higher complexity) descriptions of curves require a larger number of points. Bezier curves can be scaled up arbitrarily, and this doesn’t significantly change the complexity of the curve (although scaling many orders of magnitude will introduce a logarithmic factor complexity increase, this is quite small). Curves with larger stroke are slightly more complex than those with smaller stroke, and representing many small sharp bends require more curves than long, smooth arcs. On the downside, it’s not so easy to represent a circle as a Bezier curve. In fact, it is impossible to do so exactly. Despite the simplicity of this object (it’s even defined as a single polynomial, albeit in two variables), the best one can do is approximate it. The same goes for ellipses. There are actually ways to overcome this (the concept of rational Bezier curves which are quotients of polynomials), but they add to the inherent complexity of the drawing algorithm and the approximations using regular Bezier curves are good enough. And so we define the complexity of a drawing to be the number of bits in its .bezier file representation. Comments are ignored in this calculation. 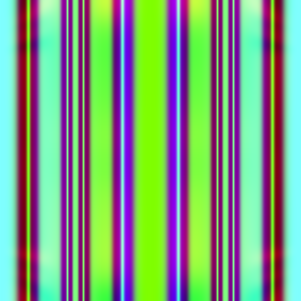 Given some sort of “seed,” write a program that produces a pseudo-random line drawing. Given an image, produce a .bezier image which accurately depicts the image as a line drawing. We will attempt to explore these possibilities in the follow-up to this post. Depending on how things go, this may involve some local search algorithms, genetic algorithms, or other methods. 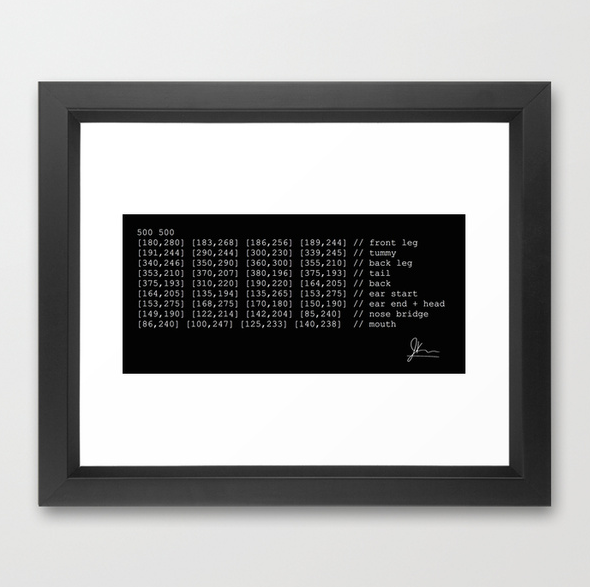 Addendum: want to buy a framed print of the source code for “Dog”? Head over to our page on Society6. Next semester I am a lab TA for an introductory programming course, and it’s taught in Python. My Python experience has a number of gaps in it, so we’ll have the opportunity for a few more Python primers, and small exercises to go along with it. This time, we’ll be investigating the basics of objects and classes, and have some fun with image construction using the Python Imaging Library. Disappointingly, the folks who maintain the PIL are slow to update it for any relatively recent version of Python (it’s been a few years since 3.x, honestly! ), so this post requires one use Python 2.x (we’re using 2.7). 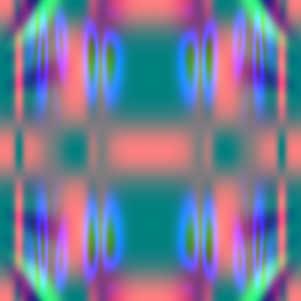 As usual, the full source code for this post is available on this blog’s Github page, and we encourage the reader to follow along and create his own randomized pieces of art! 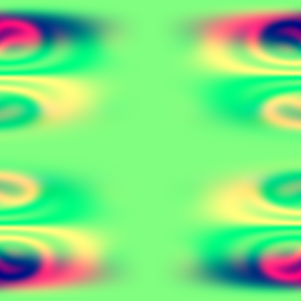 Finally, we include a gallery of generated pictures at the end of this post. Enjoy! An image is a two-dimensional grid of pixels, and each pixel is a tiny dot of color displayed on the screen. In a computer, one represents each pixel as a triple of numbers , where represents the red content, the green content, and the blue content. Each of these is a nonnegative integer between 0 and 255. Note that this gives us a total of distinct colors, which is nearly 17 million. 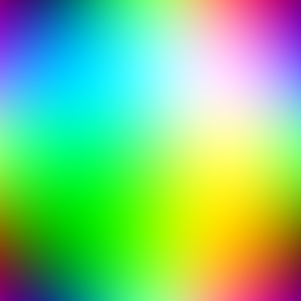 Some estimates of how much color the eye can see range as high as 10 million (depending on the definition of color) but usually stick around 2.4 million, so it’s generally agreed that we don’t need more. We could randomly generate these functions two ways, but both require randomness, so let’s familiarize ourselves with the capabilities of Python’s random library. Pseudorandom number generators are a fascinating topic in number theory, and one of these days we plan to cover it on this blog. Until then, we will simply note the basics. First, contemporary computers can not generate random numbers. Everything on a computer is deterministic, meaning that if one completely determines a situation in a computer, the following action will always be the same. With the complexity of modern operating systems (and the aggravating nuances of individual systems), some might facetiously disagree. For an entire computer the “determined situation” can be as drastic as choosing every single bit in memory and the hard drive. In a pseudorandom number generator the “determined situation” is a single number called a seed. This initializes the random number generator, which then proceeds to compute a sequence of bits via some complicated arithmetic. The point is that one may choose the seed, and choosing the same seed twice will result in the same sequence of “randomly” generated numbers. The default seed (which is what one uses when one is not testing for correctness) is usually some sort of time-stamp which is guaranteed to never repeat. Flaws in random number generator design (hubris, off-by-one errors, and even using time-stamps!) has allowed humans to take advantage of people who try to rely on random number generators. The interested reader will find a detailed account of how a group of software engineers wrote a program to cheat at online poker, simply by reverse-engineering the random number generator used to shuffle the deck. We import the random library, we seed it with the default seed, we print out a random number in , and then we randomly pick one element from a list. For a full list of the functions in Python’s random library, see the documentation. As it turns out, we will only need the choice() function. There’s no way for Python to know the textual contents of a lambda expression at runtime! In order to remedy this, we turn to classes. In many languages like C, this would be rubbish. Many languages distinguish between primitive types and objects, and numbers usually fall into the former category. However, in Python everything is an object. This means the dot operator may be used after any type, and as we see above this includes literals. This brings up another point: all methods of a class that wish to access the attributes of the class require an additional argument. The first argument passed to any method is always the object which represents the owning instance of the object. In Java, this is usually hidden from view, but available by the keyword “this”. In Python, one must explicitly represent it, and it is standard to name the variable “self”. return "sin(pi*" + str(self.arg) + ")"
Of course, this requires we set the “arg” attribute before calling these functions, and since we will only use these classes for random generation, we could include that sort of logic in the “__init__()” function. This should work well for our goals. The rest is constructing the images. Now we can construct a new canvas, and start setting some pixels. Where we construct “redCanvas”, “greenCanvas”, and “blueCanvas” in the same way above, but with the appropriate intensities. The rest of the details in the Python code are left for the reader to explore, but we dare say it is just bookkeeping and converting between image coordinate representations. At the end of this post, we provide a gallery of the randomly generated images, and a text file containing the corresponding expression trees is packaged with the source code on this blog’s Github page. Extending the Program With New Functions! There is decidedly little mathematics in this project, but there are some things we can discuss. First, we note that there are many many many functions on the interval that we could include in our random trees. A few examples are: the average of two numbers in that range, the absolute value, certain exponentials, and reciprocals of interesting sequences of numbers. We leave it as an exercise to the reader to add new functions to our existing code, and to further describe which functions achieve coherent effects. Indeed, the designs are all rather psychedelic, and the layers of color are completely unrelated. It would be an interesting venture to write a program which, given an image of something (pretend it’s a simple image containing some shapes), constructs expression trees that are consistent with the curves and lines in the image. 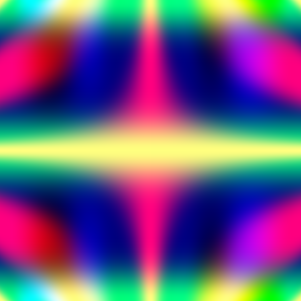 This follows suit with our goal of constructing low-complexity pictures from a while back, and indeed, these pictures have rather low Kolmogorov complexity. This method is another framework in which to describe their complexity, in that smaller expression trees correspond to simpler pictures. We leave this for future work. Until then, enjoy these pictures!